Jacquelyn and Raleigh frolic in the sands of Goose Island. Roscoe Inlet snakes a length of twenty-one miles, not as long as Dean or Burke Channels, but every bit as majestic. Its twisted channels snake through steep sided granite mountains in this area referred to as the Discovery Coast of British Columbia, part of the Inside Passage to Alaska. Snow fields liberally adorn these peaks, and but for the old log dumps speckling its length, it would seem untouched by man. We did not see a single boat its entire length. A mile or so from the very end of the inlet, a vertical stone wall displays the face of a phantom, a British Columbia Mount Rushmore, eyes slanted, nose jutting prominently into the sky, a slumber of autocratic dignity, wreathed in mist. We anchored in calm waters at the very end of this inlet and immediately were pounced on by horseflies, accompanied by hoards of biting black midges. Screens went up on all hatches to stave off any imminent attacks and were for the most part successful with just a few biters reaching the interior of the Shadowfax, our 40-foot sloop. The phantom, made of stone, is impervious to the onslaught of these winged invaders or he wouldn’t be slumbering. There is either rain and cold, or heat and insects in these areas so that the idyllic swimming (promised by our guidebook) was not accomplished for fear of adding to the bug bites we had already accumulated since Bella Coola. The First Mate got an exhilarating dousing when Captain Bob forgot the open hatch and sluiced a bucket of seawater over the deck. It was a large hatch and allowed a nice flow of icy water to pour down on the reader relaxing below, but that didn’t count as swimming. 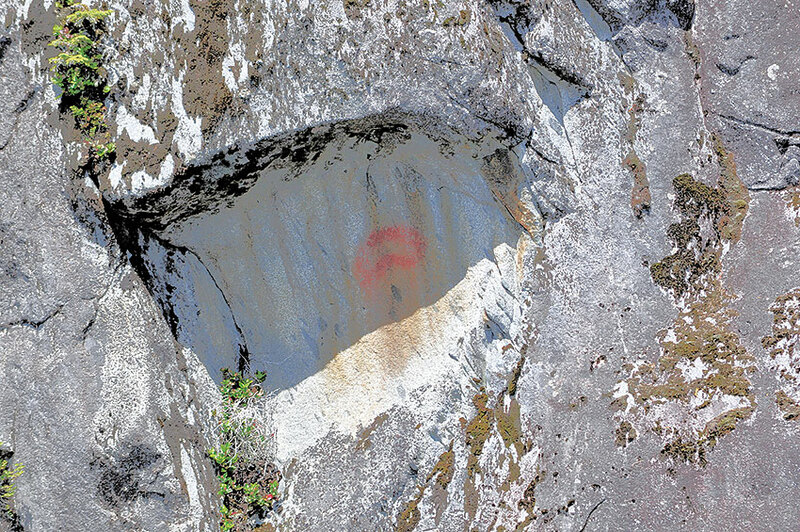 A scooped out area on a rocky point seemed the perfect place for a pictograph and indeed there was the telltale salmon egg red coloring with a definite ovoid shape. As we exited the inlet the next morning, a scooped out area on a rocky point caught our eyes. It seemed the perfect place for a pictograph and indeed there was the telltale salmon egg red coloring with a definite ovoid shape. It was reminiscent of the yellow eye pictograph in Desolation Sound and seemed to point towards a fishy presence below. We found the fish, nicely in line with the mark on shore, with our fish finder at 350 feet, but were unable to catch anything due to current (too much) and bait (too little). We know the fish will be there if we make a future visit, just as they were when the pictograph was drawn a hundred years or more ago. A day or so travel through the island archipelago brought Shadowfax and her crew to outermost Goose Island, a remote, exposed, battered, and open ocean island with little other than day moorage in its exposed harbors — but the beaches! So perfect they appear pearl gray from a distance, so thick and deep that feet and ankles disappear in sandy plushness. Raleigh, our Havana Silk dog, loved the sand; he romped, pounced, twirled and danced on the beach, bouncing as he ran back and forth in tongue lolling exhilaration, obliterating the smooth surface with his doggy footprints, a silver sprite. Raleigh’s were not the only footprints on the beach; a large deer, moose or wolf had wandered over the area when the tide was higher, leaving a trail of plunged heavy prints where the sand had been wet, and shallower marks higher on the dryer portions of the beach. 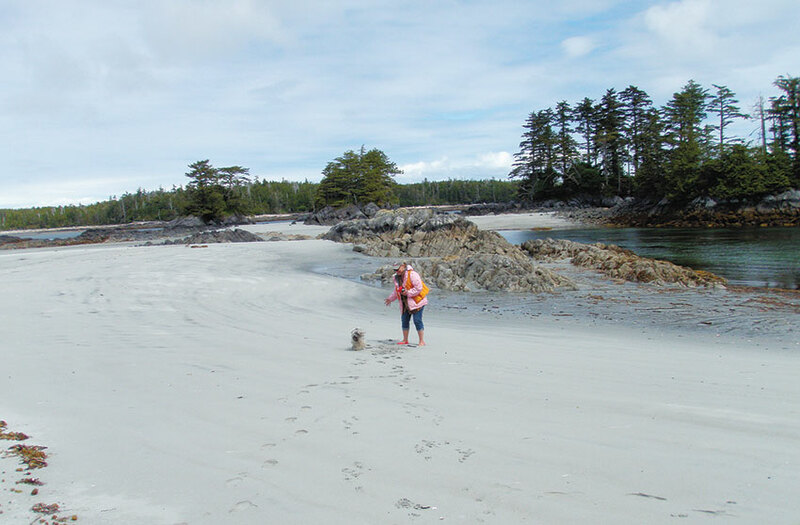 The tracks traveled on the shores from islet to islet, ending near a large cat or otter latrine. Claw marks were evident where the sand had been piled up to conceal excrement. Raleigh was entranced by the stench emanating from the area, we were not as fascinated. Boot prints in the sand also indicated a human presence, a scuffling walk along the water leading to a battered red canoe tied to a buoy. Perhaps the location of Kayak Bill’s last camp, now taken over by a new generation of escapees from civilization, camping in serene isolation. Kayak Bill was one of the last long term tenants here; he was a transient kayaker who lived off the land, a recluse whose body was found in 2004 on Goose Island in his final camp. 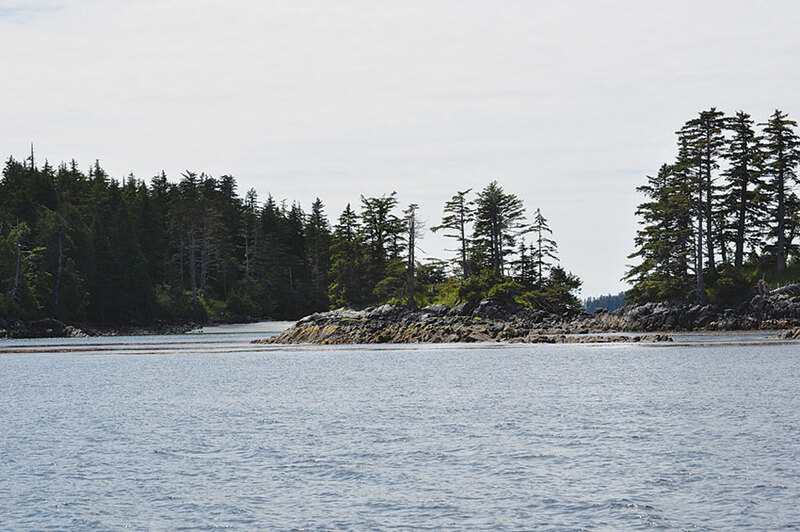 He paddled and camped throughout the area for years and rumor has it he would spend winters out on this remote island, a day or two paddle from Bella Bella and Shearwater. The spirit of Kayak Bill still lingers here, but it feels gentle, sharing, as if to say that intrusions are permitted if no traces are left to disturb the pristine quality of this beautiful bay. Anchorage at Goose Island looks inviting, but really too exposed for overnight anchoring. Heading south, we left places with names like Typhoon Island, Spitfire Channel and Hurricane Island to sail towards Nalau Passage near Hakai Pass for our next anchorage. It was a little like the story of Goldilocks and the Three Bears, it took three tries to find the spot that felt right, like the three bowls of porridge. Two attempts in small coves did not feel secure, buffeted at anchor and with weather worn trees attesting to the strength of local winds. For the third attempt we motored to the inlet that slashes across Stirling island. A few more eons with its attending earthquakes and the inlet will cleave the island into two parts. It is possible to hike along its cleft to look out over Kildidt Sound and the open ocean beyond. It is a long narrow anchorage that shows evidence of earlier native occupation with pictographs on an east facing wall. One area we passed had deliberate boulder built up on the shoreline and seemed to be waiting for the next peoples to rehabit. No vestiges were left but the atmosphere was welcoming, the anchorage serene and secure.